At Hauslein Tiny House Co, we are professional tiny house builders based in Port Macquarie, NSW. Our beautiful ‘Sojourner’ Tiny House (display model pictured) is now available – built to order (2 other models also available, as well as partial builds). Turn around time is 2-4 months. Our tiny houses are built to the highest standard. We believe in quality that will last and look beautiful for generations to come. Our tiny houses are built using only solid timber and solid ply, no MDF or chipboard anywhere. Bench tops and floors are solid Cypress Pine, internal walls are solid pine tongue & groove paneling, external cladding is Western Red Cedar and Monument Matte Colorbond. It’s insulated, road registered (4.5 tonne), includes generous storage space including wardrobe, Dux gas hot water system, traditional flush toilet which can be plumbed into existing septic system or can be changed to a composting toilet. It features a laundry shoot from the upstairs bedroom, queen size mattress with ample head room for reading, breakfast bar area, soft accent lighting under kitchen cupboards, dimable living area lights, black powerpoints with USB sockets in kitchen area. It plugs in the same way as a caravan with a regular power point connection and garden hose fitting. 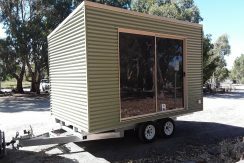 To put this in the backyard & have a member of the household live in it full time requires no council approval which makes it very simple and cost effective to just wheel into place for an instant granny flat. We can provide general information on council requirements for other settings also, though you may need to speak with your local council (you can ask us to help with this). Feel free to browse our website if you’d like more information, would like to order another Sojourner with some customisations or are interested in other models. Feel free to ask any questions or contact us to book a tour of a display. Phone Sarah on 0403 026 586. Delivery available. Please request a quote.